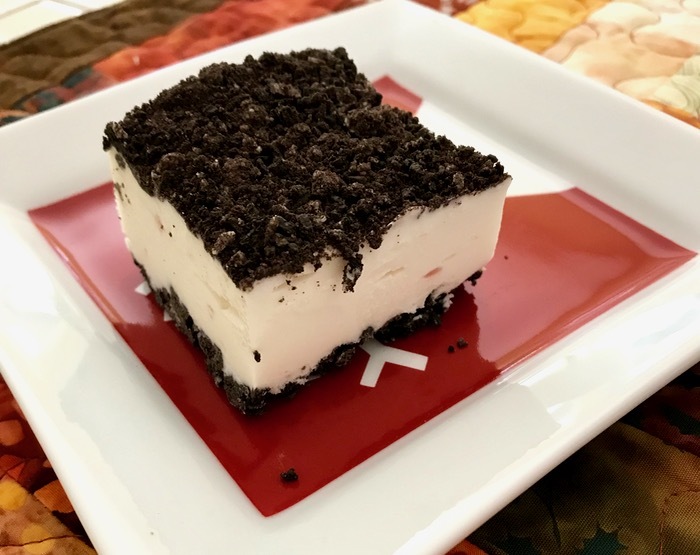 This uses three ingredients. Now that’s a quick dessert. However, it does need to spend some time in the freezer. So, please, begin this the night before your event, in order to let this freeze solid. 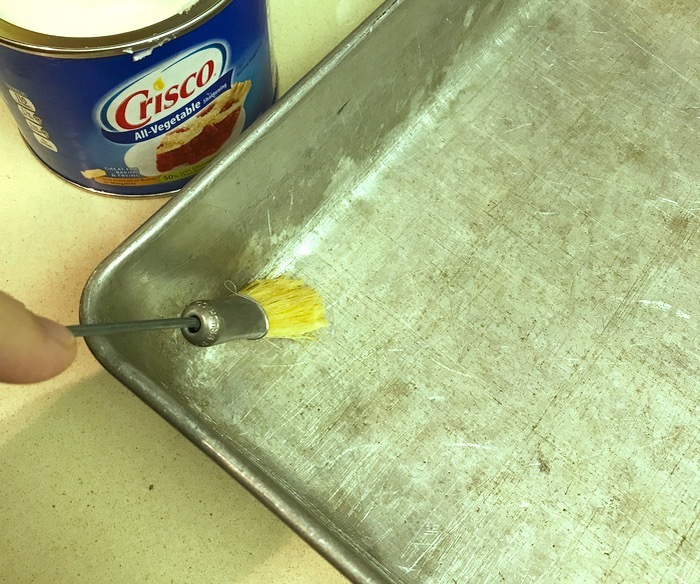 Prepare the pan by lightly greasing the bottom only of a 9 x 13 inch pan. 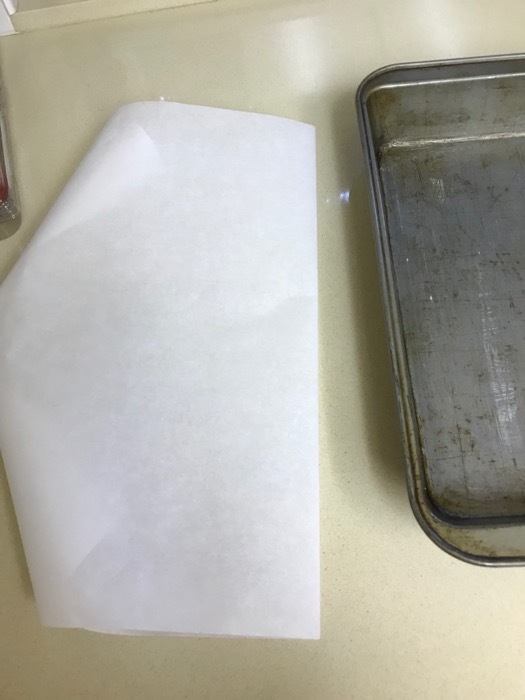 Fold a length of parchment paper in half, creasing well. 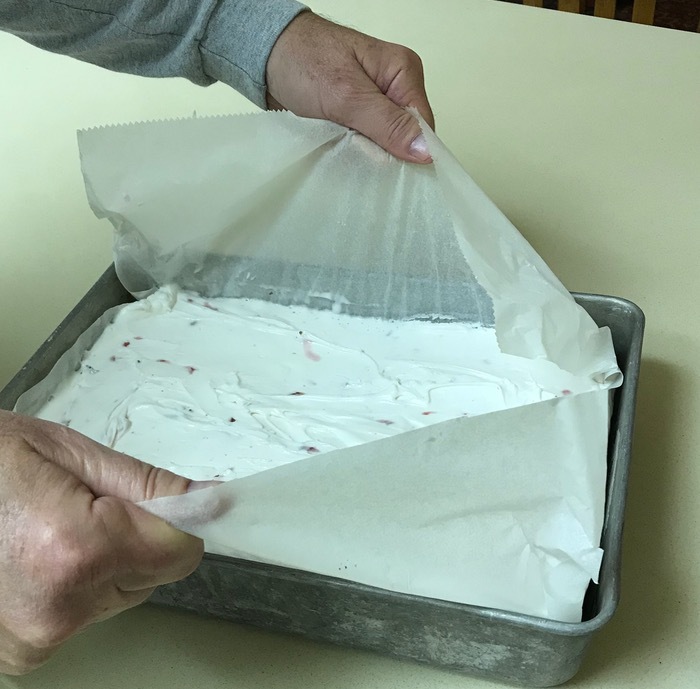 Use that crease to center the parchment paper, then smooth out, letting the paper overhang the long edges by about 2-3.” Set aside. 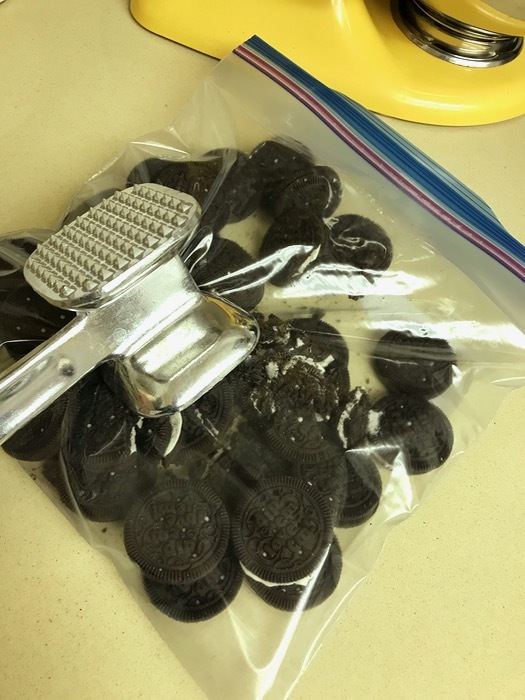 Put all the cookies into a zipper plastic bag, OR into a bowl OR into your food processor (easiest). Crush them thoroughly, or if you have a food processor, pulse until the texture of fine gravel, or chunky sand. The crumbs should be small, with no obvious big chunks of cookie. 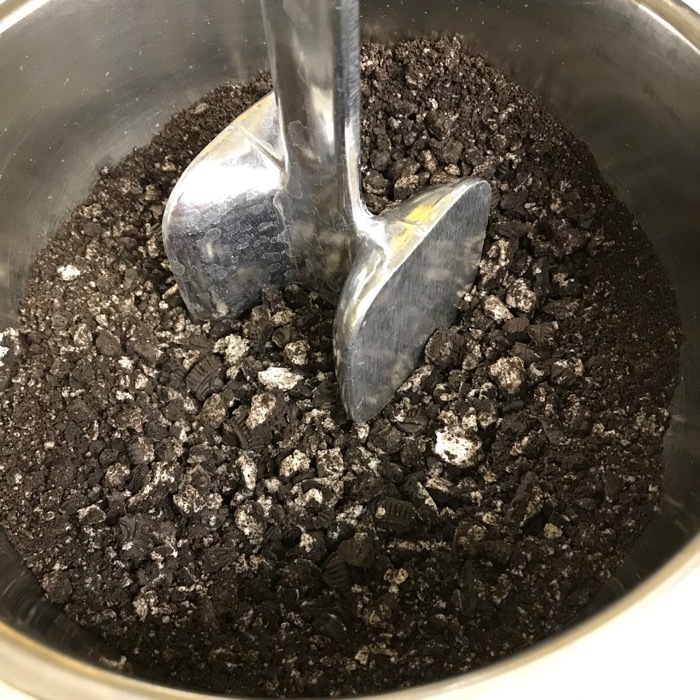 Reserve one cup of the this pulverized mixture for the crumble topping, and if it’s not really fine, do some more crushing. Set aside. Place the remainder of the crushed cookies into a mixing bowl, and add 1/4 cup melted butter. (I like the real thing.) Mix well. 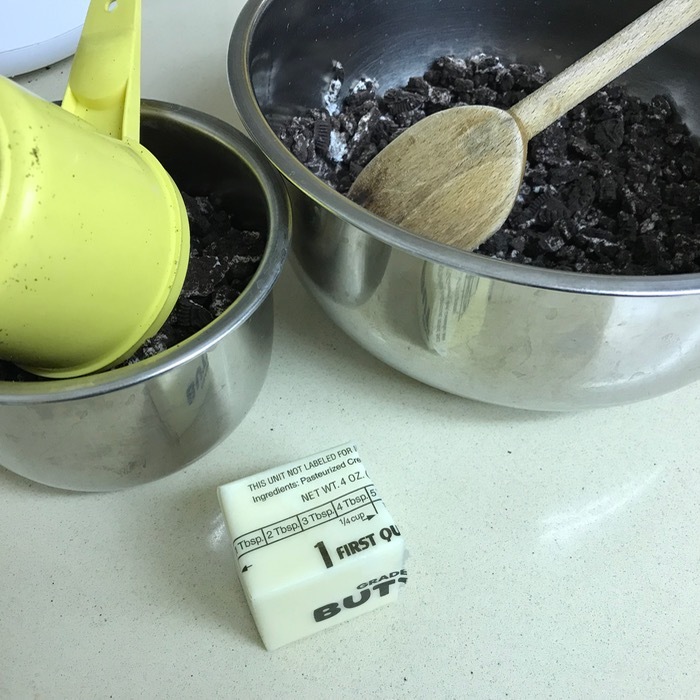 Pour into the prepared pan, and press firmly with the back of a spoon to even out the crushed cookies. Place in freezer until solid, about 2 hours. Set out one carton of ice cream on the counter for about 15 minutes, or until the carton yields slightly when squeezed. Dump (squirt, sort of ) into a mixing bowl fitted with the paddle beater, let sit for about another 10 minutes. 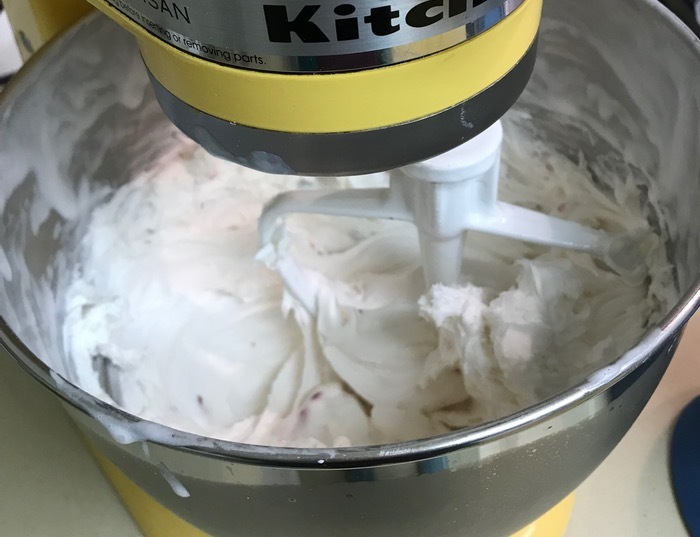 Turn on mixer slowly, then up to medium, while you beat the ice cream into a creamy mixture. 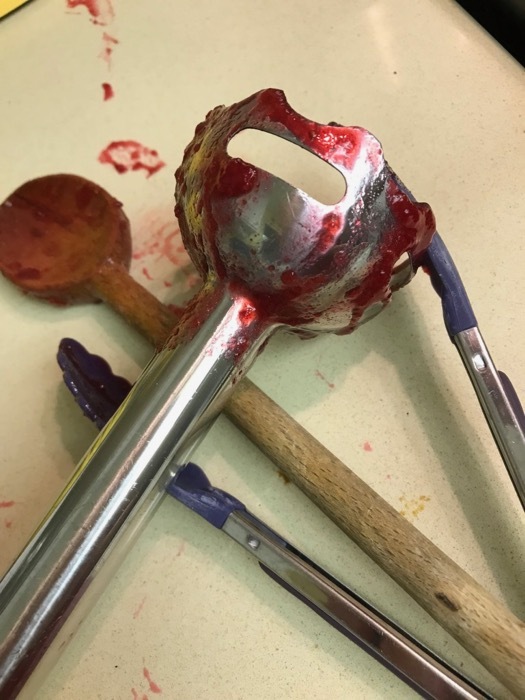 If you don’t have a mixer with a paddle attachment, use a bowl and a sturdy spoon. You don’t want the mixture to melt; it should be creamy, not runny. Work fast if you are doing it by hand. 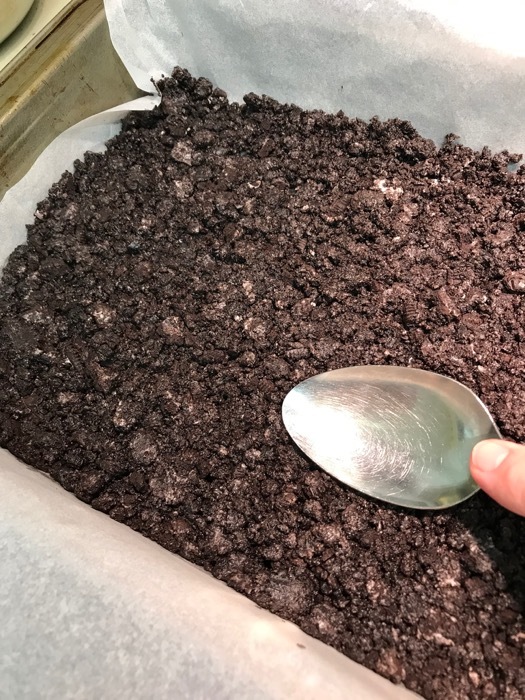 Spoon it out onto the frozen layer of crushed cookie in glops; spread evenly. Sprinkle with the reserved cookie crumbs, and refreeze. 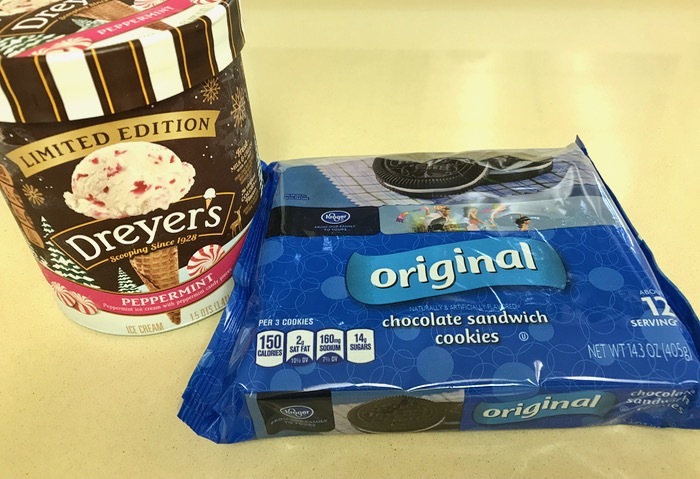 It will take at least four to six hours for the ice cream to freeze properly. 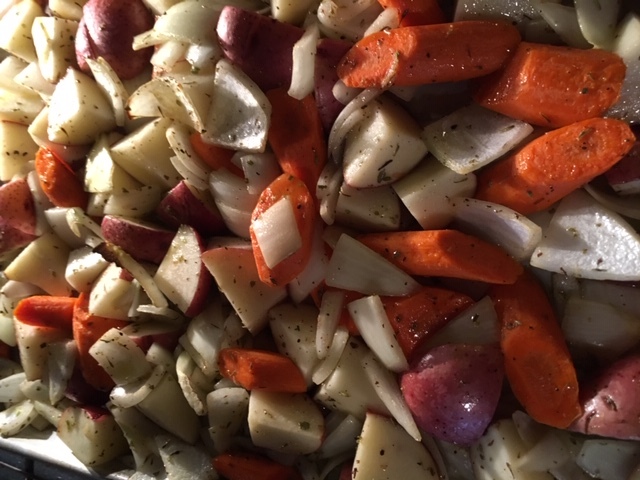 Stir rosemary, herbes de Provence, and oil in a small bowl. Rub all over pork; season with salt and pepper. 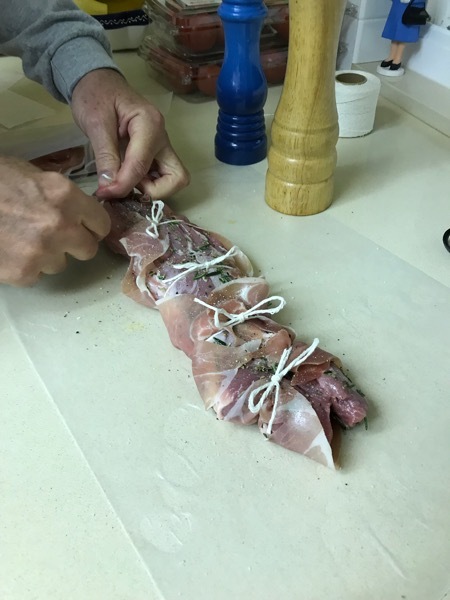 Wrap prosciutto slices around pork and tie at 2″ intervals with kitchen twine to hold together. DO AHEAD: Can be made 1 day ahead. Cover and chill. 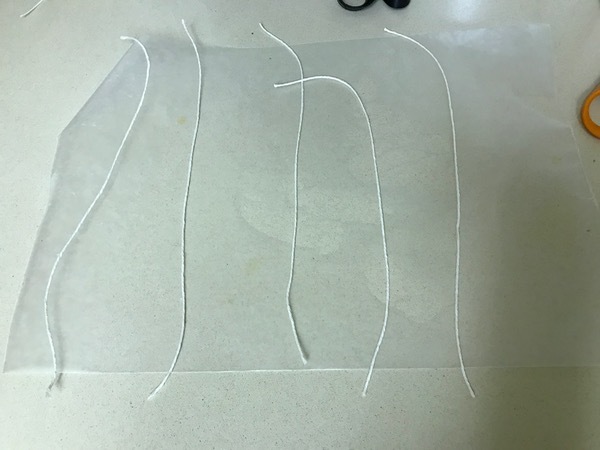 To make life easier, I spread out a length of wax paper, cut five piece of twine, and laid them out like railroad tracks. I laid out the prosciutto in an area that I thought might match the length of the pork loin, plus double the width. 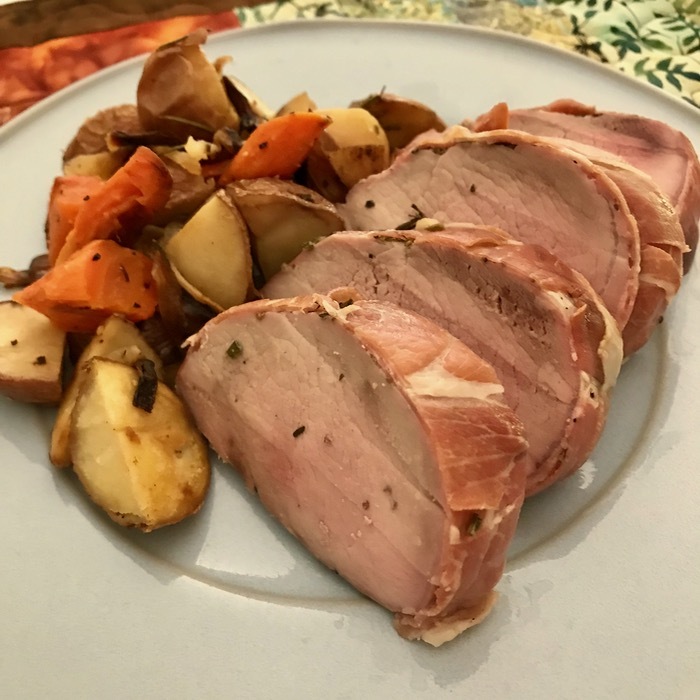 I placed the herbed meat on top of the prosciuttio, then brought the string up and tied it, which wrapped the prosciutto into place. We flipped them over when we placed them in a lidded container, which we then put into the refrigerator overnight. Spray a broiler pan with cooking spray (don’t forget the bottom of the pan that catches the drippings), place the pork loin on top. 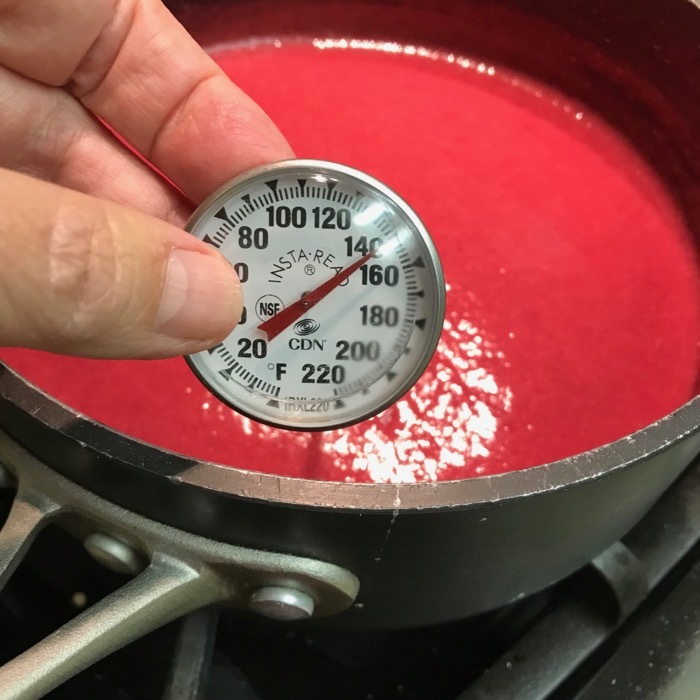 Bake at 400 degrees for about 30 minutes, or until an instant-read thermometer inserted into the middle of each loin registers 145 F. Tent and let it rest for 10 minutes. Transfer tenderloins to a cutting board, slice thinly and serve with plum chutney, or cranberry sauce. NOTE: If using a charcoal grill, build a medium-hot fire; push coals over to 1 side of grill. If using a gas grill, heat all but 1 burner to high. Grill tenderloins over hot part of grill, turning frequently, until a crisp brown crust forms on all sides, 8-10 minutes. 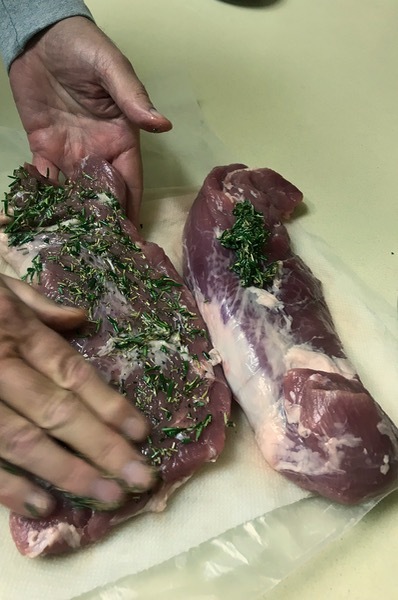 Move tenderloins to cooler part of grill to gently cook through; cover and cook until an instant-read thermometer inserted into the middle of each loin registers 145°F, 15-20 minutes longer. I first saw this on the New York Times website, then saw it again on the Bon Appetit website, then about a bajillion other bot-driven websites (all looking the same, all “authored” by a single-named woman, who promised hearth and home and happiness while inundating the viewer with ads-ads-ads). What is it with these robot websites?? I read about 90% of the comments on the NYTimes recipe site pertaining to this recipe, and have incorporated my changes below. 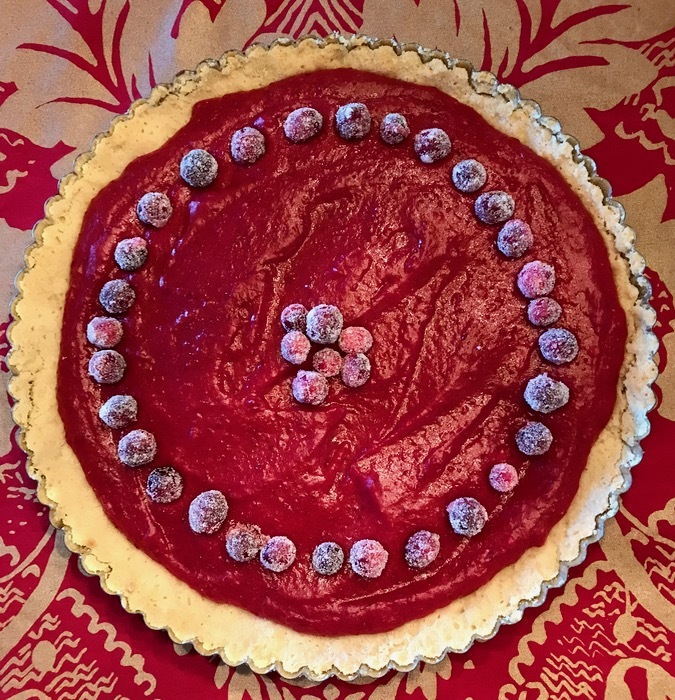 This pie is gluten-free because I wanted to make it for a woman at my church who can’t eat gluten, and has not had a dessert at a church dinner in a millenia. This is my holiday gift to her, and to you. First, the recipe, then the photos (reverse of the usual). Place in medium bowl, stir to mix (or use food processor). To bake, preheat the oven to 350 degrees. 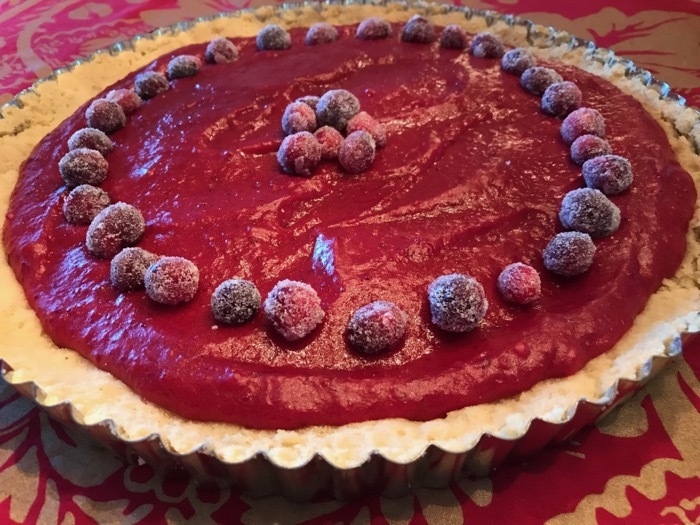 Place the chilled tart shell with the foil into the oven and bake about 10 minutes. 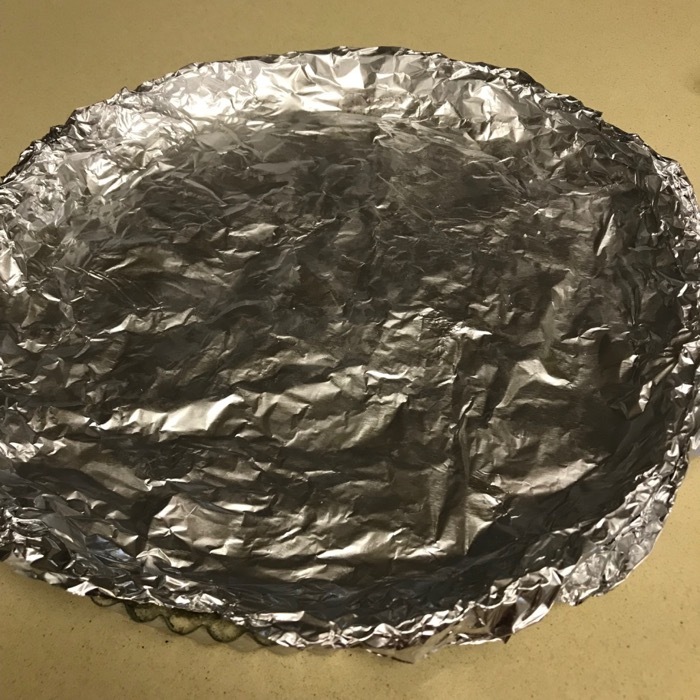 Remove from oven, and carefully take off the foil. Finish baking for another 5 minutes. Cool. 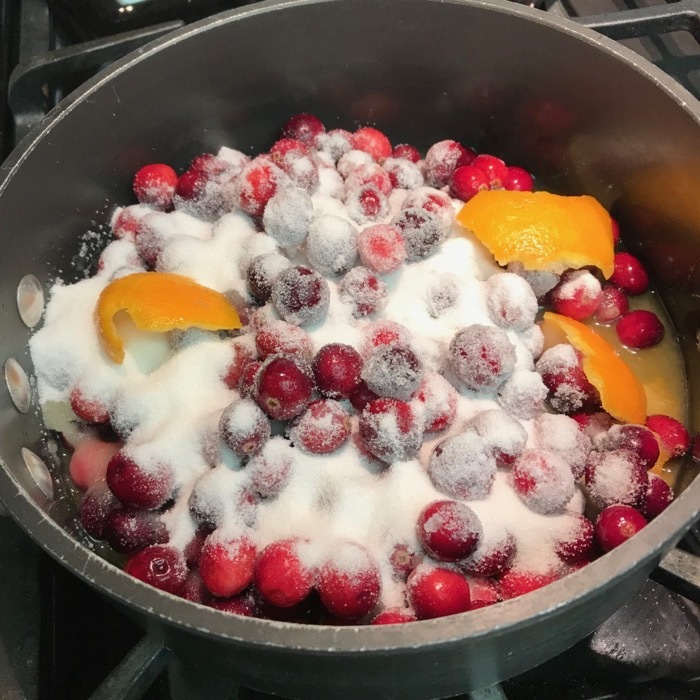 Put cranberries, sugar, orange juice and peel in a saucepan over medium heat. 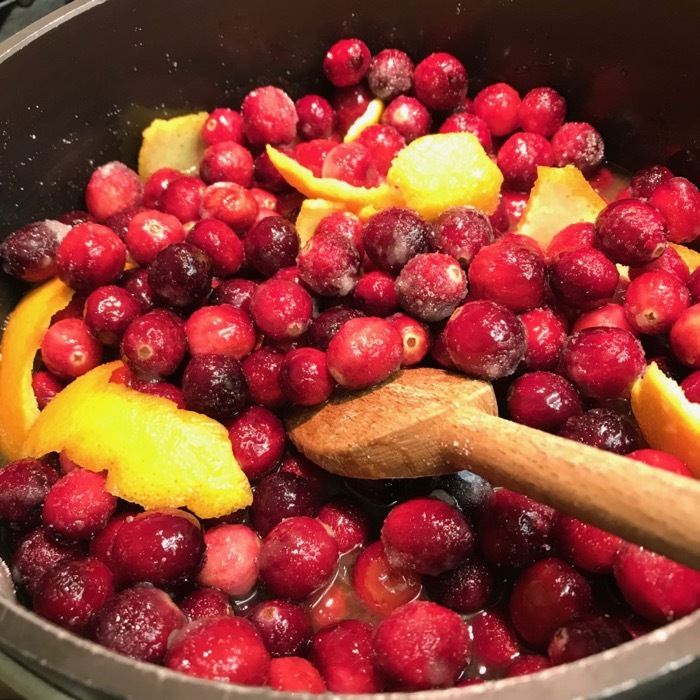 Simmer until cranberries have popped and softened, and liquid has diminished, about 10 – 15 minutes. Remove orange peels. 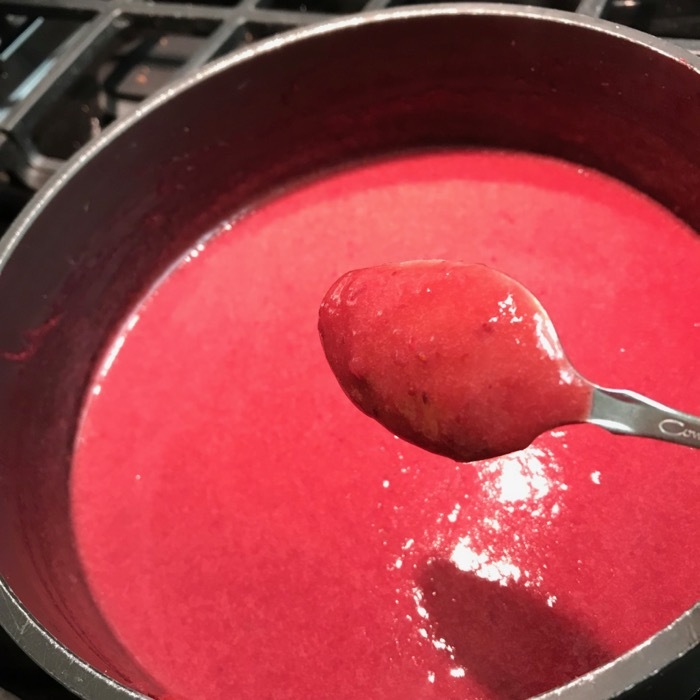 Using an immersion blender, blend the mixture until berries are not noticeable in the pan. Wash the pan (or get another). Break in the two eggs, then add in the two egg yolks. Stir to break up yolks. Stir in 1-1/2 teaspoons (1/2 Tablespoon) cornstarch until blended. You may see some white bumps; ignore. 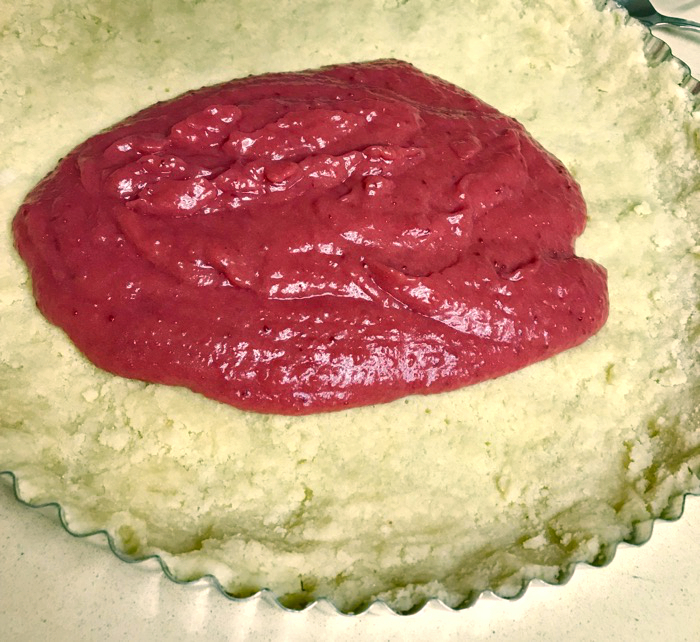 Spoon cranberry puree into the yolk mixture. Set over low heat, and constantly whisking/stirring, bring mixture to a temperature of between 140 and 160. 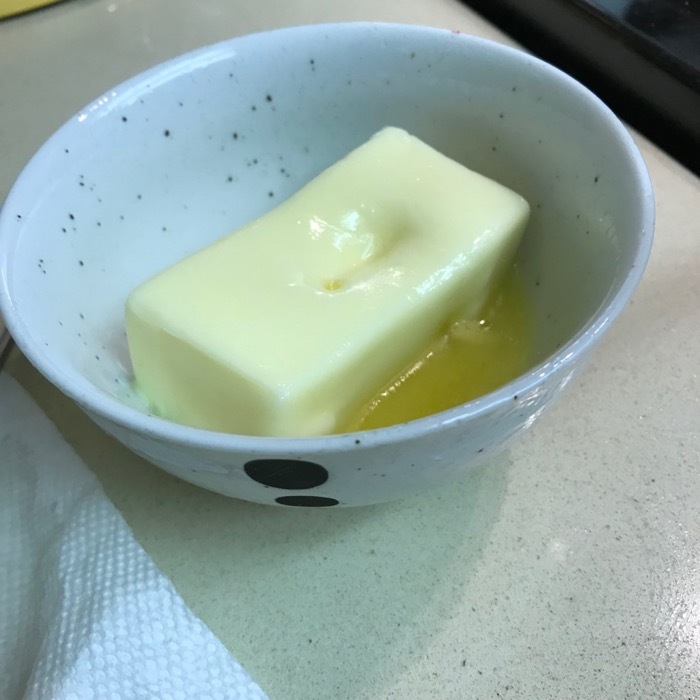 The commenters noted that when properly cooked, the curd should coat a spoon. This took me about 15 minutes. I did keep it constantly stirring, but I wasn’t beating it. I didn’t want to incorporate any air into the mixture and disrupt the anticipated color. Remove from heat, and stir in the butter a bit at a time, whisking well in between each addition. 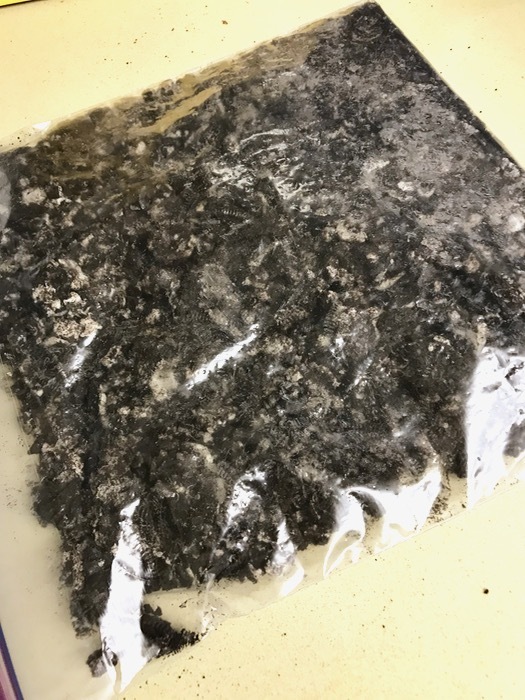 Again, don’t incorporate air in your mixing. 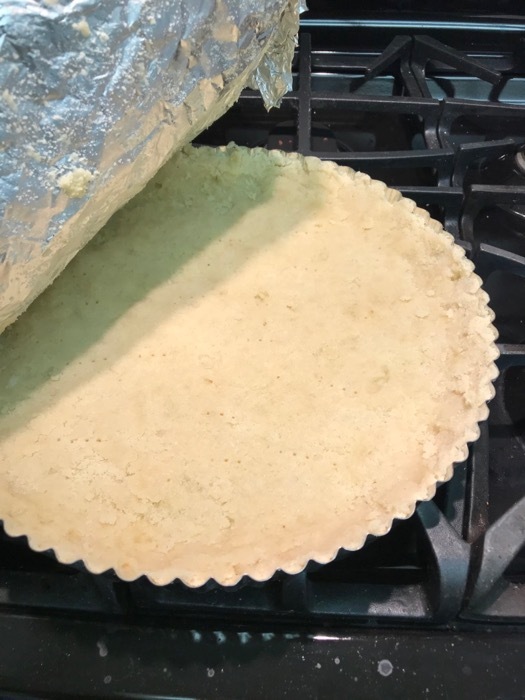 Let cool to room temperature (mine was a little warmer), and pour into the prepared pie shell. Bake at 350 for 10 minutes, in order to set the curd. Cool on a rack. Store at room temperature for up to 2 days. Boil together 3/4 cup sugar and 1/2 cup water until mixture is at a full boil and looks clear. If you have time, let the syrup cool. 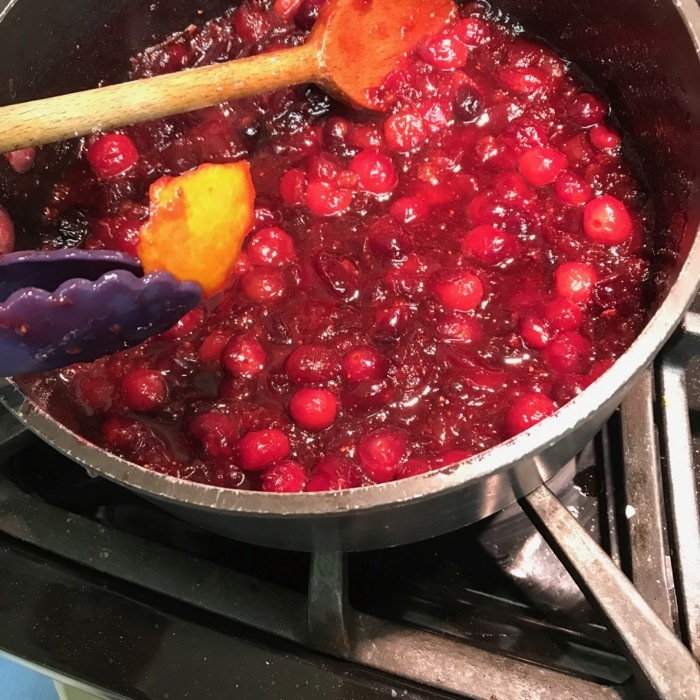 Wash and pick out your best handful of berries (3/4 to 1 cup), and stir into the syrup, making sure they are well coated. 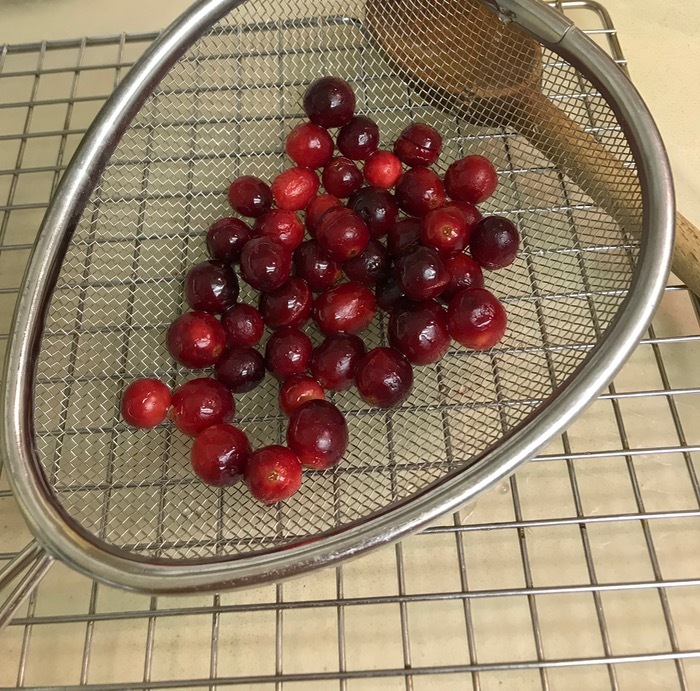 Remove to a fine rack (or into a strainer). 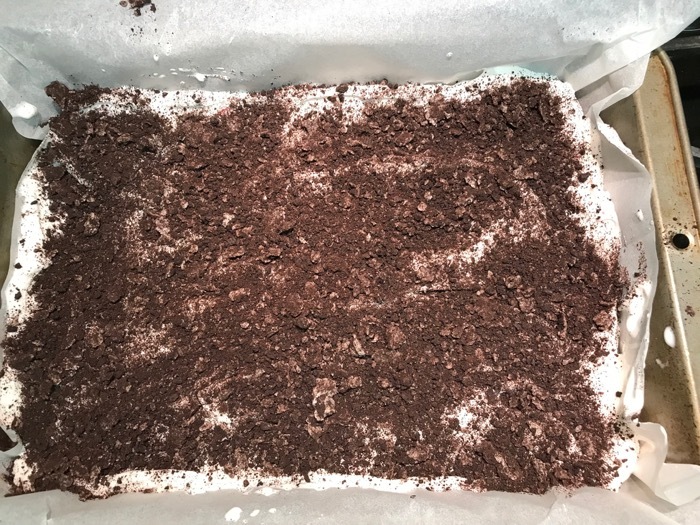 Sprinkle some sugar onto a square of waxed paper, and sprinkle some more over the top. 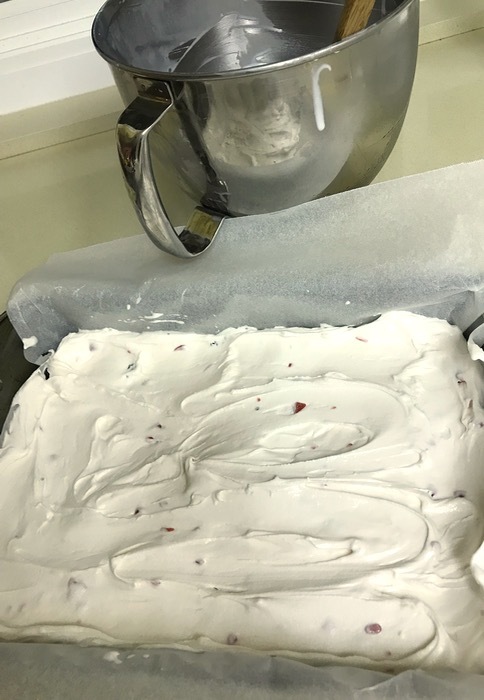 Then roll the berries in the sugar. If they are well-drained, you won’t get clumps of sugar, but a nice, even coating. Let cool and dry, then decorate the top. I meant to clip some mint sprigs to place at the center berries; you might want to consider this. 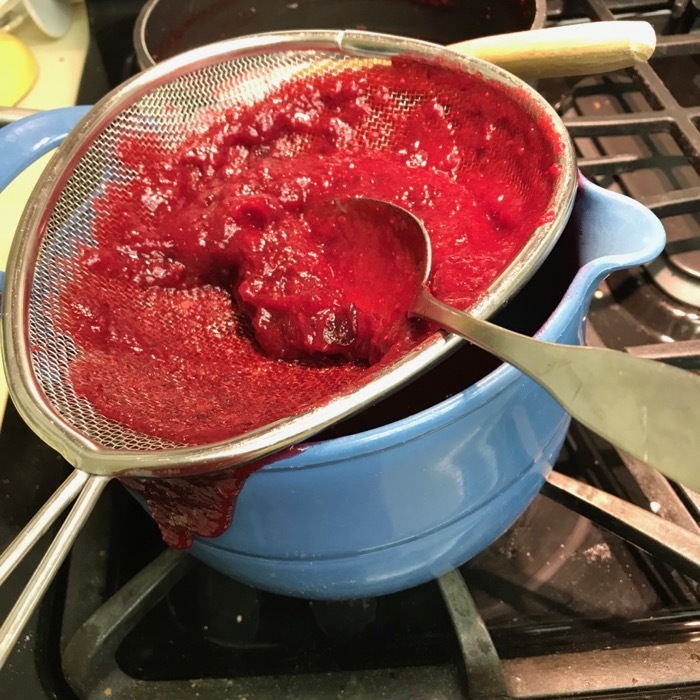 After all was said and done, I had about 1/2 cup left of the cranberry mash in my sieve from making the curd. This went nicely with a slice of Cranberry-Orange Bread that I had in the freezer, as it’s like a jam. Store in the refrigerator. If using the almond crust, best eaten on the day you make it. Day One: it was perfection. Day Two: crust was really soft, but curd was still good. Curd can made be ahead. Cover curd with plastic wrap (pressing it against the surface of the curd) and refrigerate up to one week. To prepare the brussels sprouts, remove any yellow or brown outer leaves, cut off the stems and cut in half. In a large bowl, toss the brussels sprouts, olive oil, salt and pepper together. Once all of the brussels sprouts are coated in oil, spread them into a 9-by-13-inch (or larger) baking dish or sheet tray to roast. 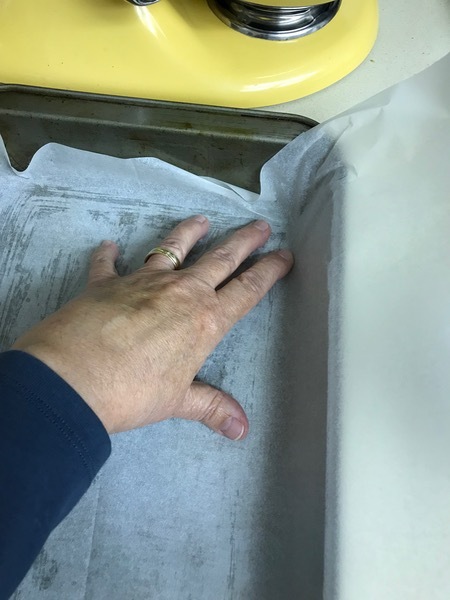 Note: You may want to line your sheet tray with foil for easy cleanup because the caramelizing process leaves a sticky residue. After 15 minutes, stir the brussels sprouts with a spatula or large spoon to even out the browning. After 30 minutes, stir in the maple syrup. Continue to roast the brussels sprouts for about 15 more minutes, or until they are fork tender (about 45 minutes total roasting time). 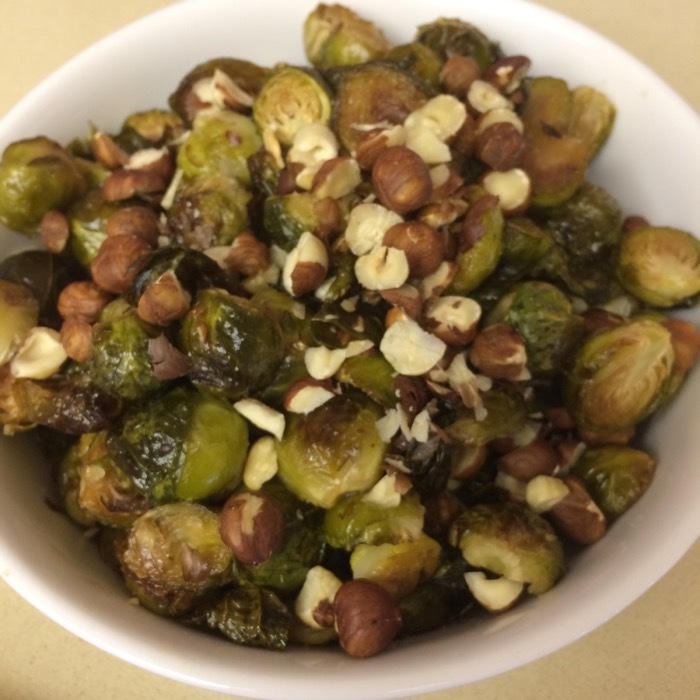 Toss the roasted brussels sprouts with the hazelnuts and devour! NOTE: If your sprouts are on the smallish side, they may need less time overall. Cook only until fork tender. To toast hazelnuts, place in pan over low heat, tossing or stirring frequently so they don’t burn. They should let off a fragrance when they are toasted, in probably no more than 5 minutes total time.